Darius Days had season-highs with 13 points and nine rebounds as LSU defeated Grambling 78-57 in a non-conference game at the PMAC on Saturday afternoon. LSU got off to a quick start by outscoring Grambling 14-2 in the first four minutes. Days had five points in that stretch – one free throw and two field goals. Tremont Waters and Kavell-Bigby Williams had baskets and Skylar Mays knocked down a 3-pointer. Ja’vonte Smart’s field goal put LSU ahead 14-2 with 16:10 before halftime. In that span, Grambling was 1-of-5 from the field and committed three turnovers. Promoted to the starting lineup, Days responded with his best game of the season – 13 points and nine rebounds. Days was 5-of-8 from the field. He also had a season-best three steals. Days’ five field goals were also a season-high. Days scored five points when LSU jumped ahead of Grambling 14-2 to start the game. LSU’s starting lineup consisted of Bigby-Williams and Days in the post, Smart and Mays on the wings and Waters at point guard. The five starters all played more than 20 minutes. Bigby-Williams played the fewest minutes of the starters with 24. . .Bigby-Williams’ nine blocked shots were the most by a LSU player in 13 seasons. Tyrus Thomas blocked nine shots against Tennessee in the 2005-06 season. Bigby-Williams was 4-of-6 from the field. However, he missed three of his four foul shots. . .Waters made six of his eight field goal attempts, including 2-of-4 on 3-pointers. He also had three steals. . .Waters and Bigby-Williams were responsible for ten of the Tigers’ season-high 19 turnovers. Waters had six turnovers and Bigby-Williams had four. . .Mays scored in double figures for the sixth straight game. But, he missed five of his eight field goal attempts. He was 2-of-6 on 3-pointers. Mays’ six rebounds were a season-high. . .Smart had his second consecutive poor shooting game as he was 3-of-11 from the field. Smart made just two of 13 field goal attempts against Oklahoma State. . .Reid came off the bench and played just 18 minutes. He missed eight of his ten field goal attempts. Reid’s seven rebounds matched his season-high. . .Williams, who played 20 minutes, missed all three of his field goal attempts. . .Marlon Taylor had nine points in 21 minutes. . .Walk-on Will Reese made a basket in the final minute. . .Daryl Edwards was not in uniform. . .Dallas Polk-Hilliard, who entered the game averaging 14 points and eight rebounds for Grambling, finished with two points and no rebounds. The 6-foot-7 wing, who was guarded by Mays to start the game, was 1-of-5 from the field. . .After trailing by 12 points four minutes into the game, Grambling hung around for the remainder of the opening half. A basket by Zavier Peart left Grambling behind LSU 31-25 with 3:13 before halftime. LSU scored the game’s only four points in the last three minutes – a 3-pointer and one of two free throws by Waters. . .LSU outscored Grambling 11-2 in the first three minutes of the second half to go ahead 46-27. Days scored four of those 11 LSU points. . .LSU extended its homecourt winning streak to 12 games. Its last loss at the PMAC came against Georgia last January. . .LSU now has an 18-game winning streak against in-state opponents. The last Louisiana school to beat LSU was Nicholls State seven seasons ago. . .LSU is 6-2, while Grambling is 3-4. . .The paid attendance was 8,474. The actual crowd was a little less than 4,000. 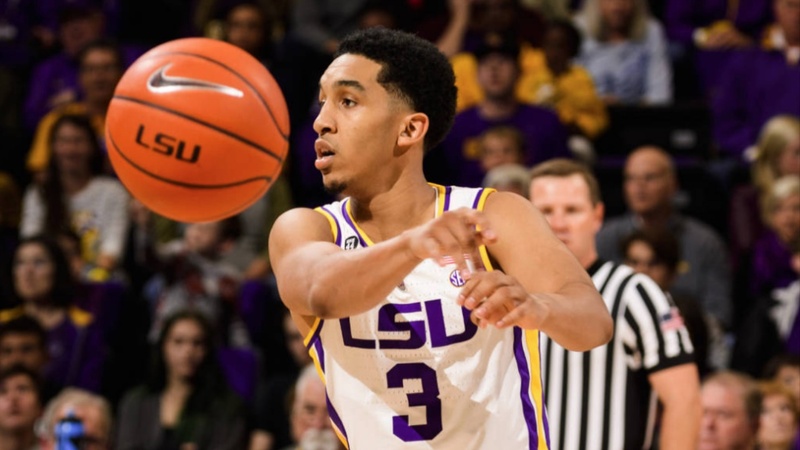 LSU will play host to Incarnate Word at the PMAC on Sunday, Dec. 9. Tipoff is scheduled for 1 p.m. Central. The Cardinals (4-5), who have lost three games in a row, will play host to Trinity University in San Antonio on Tuesday night. The LSU-Incarnate Word game will be available on the SEC Network.